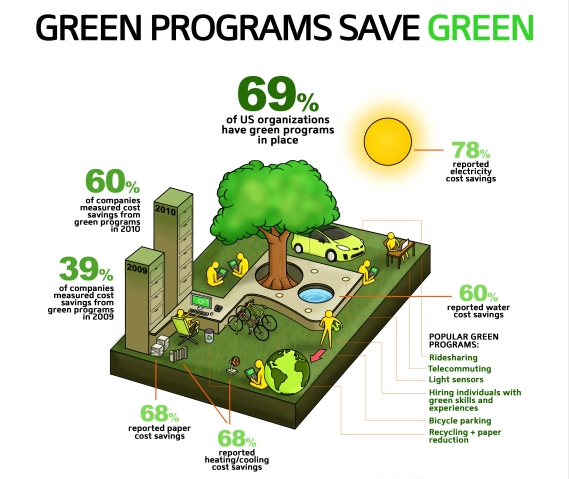 The number of American businesses with formal green programs in place increased 54 percent last year according to new research from Buck Consultants (a subsidiary of Xerox). Of about 120 businesses surveyed — including hardware and other technology firms, government offices, consultancies, non-profits, hospitals, and the makers of consumer packaged goods — 69 percent said they took deliberate measures to improve their environmental and social impact in 2010. What motivated companies to go green, officially? Fifty-eight percent said they started their programs to create “community goodwill,” and 46 percent said they did so to improve stakeholder perception of their business. During the recession, however, 78 percent of companies with green programs came to view cost savings as the top, desired return on investment. Over 90 percent of companies realized cost savings as a direct result of their green programs: 78 percent of them saved on electricity, 68 percent on heating and cooling, 68 percent on paper, and 60 percent saved on water. About 9 percent of companies with formal green programs said they failed to save money thanks to their initiatives in 2010. Spending may have exceeded savings in some cases; big-ticket items like electric vehicles for company fleets, or the installation of solar canopies and rooftops, and building-wide, networked lighting systems that use sensors and LEDs (light emitting diodes) can cost a company in the short-term, for example, but lead to savings on fuel or electricity over the longer term. More than half of the companies surveyed used renewable energy in their buildings in 2010. Twenty five percent of buildings occupied by companies with green programs in place were powered by solar, 15 percent by wind, 12 percent by geothermal, another 12 percent by hydropower, 11 percent by biomass and 11 percent by “other” undefined sources of renewable energy. Startups and innovators are likely to see opportunity, rather than a lack of progress, where businesses — and building owners— have failed to embrace clean technology and better habits, so far. Still, it’s hard to imagine how any American employer in the year of the BP Oil Spill failed to implement a formal green program. Amazingly, 31 percent of companies surveyed did not heed the call. The slackers had their excuses. Looking ahead, of all the companies surveyed 66 percent had no plans to reimburse employees for hybrid or clean vehicles within the next year or soon thereafter, 36 percent weren’t planning to give employees time off for environment related community service, and 40 percent weren’t considering socially responsible pension investment options. Instead, companies planned to implement the following green programs, either within the next twelve months or after one year: green training for employees (19 percent) or for executives and leadership (16 percent); green procurement training (30 percent); and online HR communications (16 percent).